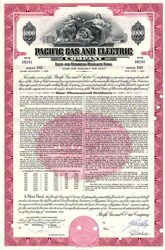 Beautifully engraved $1,000 Bond certificate from the Pacific Gas and Electric Company dated 1958. This historic document was printed by the American Bank Note Company and has an ornate border around it with a vignette of 2 allegorical women with an antique tool between them. This item is hand signed by the Company's Officers and is over 46 years old. Punched cancelled in EF Condition. Pacific Gas and Electric Company is one of the largest combination natural gas and electric utilities in the United States. The company serves approximately 13 million people throughout a 70,000-square-mile service area in northern and central California. Pacific Gas and Electric Company voluntarily filed for reorganization under Chapter 11 of the U.S. Bankruptcy Code on April 6, 2001. On June 19, 2003, federal Judge Randall Newsome announced the settlement agreement between PG&E and the CPUC�s staff. In December 2003, the CPUC approved the settlement agreement and the Bankruptcy Court confirmed the plan of reorganization. SAN FRANCISCO � Pacific Gas and Electric Company today emerged from the Chapter 11 process it initiated to resolve the financial challenges resulting from the California energy crisis. The resolution � supported by the company, its creditors, the California Public Utilities Commission (CPUC), labor, and environmental and consumer groups � restored the utility�s investment grade credit ratings, satisfied all valid creditor claims, and provided the basis for a substantial reduction in electric rates, with the potential for additional savings to customers in the future. �Regaining our investment grade credit ratings, paying creditors in full, and doing so without raising customer rates achieves our objectives, and puts the energy crisis behind us,� said Robert D. Glynn, Jr., Chairman, CEO and President of PG&E Corporation. A significant $800 million electric rate reduction for customers that was implemented in March. The company will continue to work with state and federal officials to pursue refunds from energy suppliers who charged excessive prices for gas and electricity during the energy crisis; and any refunds will go to further reduce customer rates. Environmental benefits, such as the protection of 140,000 acres of sensitive watershed lands surrounding the company�s hydroelectric facilities, and the creation of a non-profit corporation to support research and investment in clean energy technology. Restoration of the utility�s investment grade credit rating to allow the company to access the capital markets in order to finance the infrastructure improvements and long-term procurement of natural gas and electricity to meet customers� growing demand. In 2004, the company will invest approximately $1.4 billion in its electric and natural gas systems. In addition, through an agreement reached with The Utility Reform Network, the company is working to obtain legislative approval to refinance a portion of its costs with a securitized dedicated rate component. If the refinancing is successful, customers could potentially save up to $1 billion in lower financing and tax costs over the term of the agreement. �By resolving these financial challenges in a collaborative manner, we are able to move forward on a sound financial basis in a more stable regulatory environment,� Glynn added. As it emerged from Chapter 11, Pacific Gas and Electric Company made approximately 2,100 payments resolving $8.4 billion in allowed creditor claims, and deposited $1.8 billion in escrow accounts for disputed claims. The company used the proceeds from the approximately $6.7 billion bond offering, $2.4 billion in cash on hand, $0.8 billion funded by term loans, and $0.3 billion from a credit facility to pay creditors. In addition, approximately $814 million in pollution control bonds was reinstated, and the company paid about $93 million in preferred stock dividends and sinking fund payments that were in arrears.